Hailing from Ontario, Canada (A lovely place to visit I might add) James Barker Band are really starting to make waves within the country music world and deservedly so. 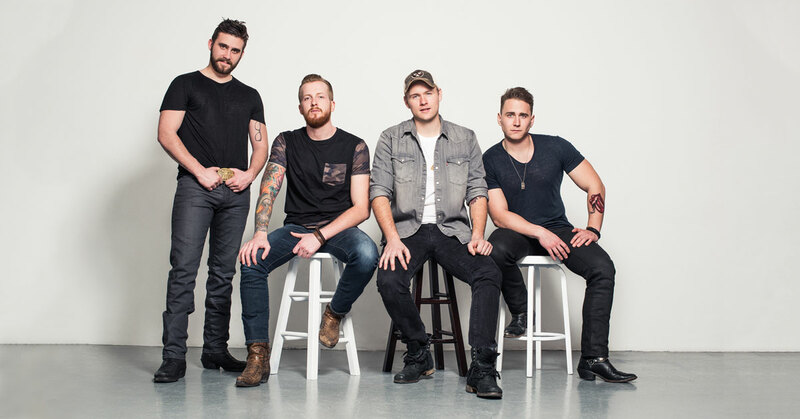 If you like artists such as Old Dominion, Dierks Bentley and so on then this band are for you. The energy the group have on their studio releases is really exciting so in a live setting, well..I can only imagine it being insane. I may even go as far as to say that I think James Barker Band are going to to be one of the artists across C2C weekend that people will talk about a lot and perhaps have as much of a high demand from the UK as Old Dominion did after their first visit here. Now I love a band that has a lot of personality within their music and James Barker Band certainly have that. Their videos are hilarious, just watch the new video for Keep It Simple. One thing I feel is that we didn’t get enough of them at C2C so I do hope they come back as I for one, due to many media commitments didn’t get to see them and that is something I really regret. We caught up with James Barker Band at C2C. With both of our schedules being all over the place and original venue closing at a certain time, our interview had to be held by the escalators by TGI Fridays and it was very noisy haha. The guys were really lovely and I could have chatted for much longer. Hey guys how are you? How has C2C been for you so far? James: Oh it has been amazing. This is our first time being across the pond and it’s amazing, we will back for sure. None of you have even been here before, even on vacation? What were your expectations? Had anyone told you what the fans were like in the UK? Bobby: We didn’t expect there would be this amount of fans, let alone engaging fans. James: I didn’t think it would be this fanatical. Specifically for us, it is crazy to see how many people fill the O2 for the main stage. For us the response of people knowing the lyrics, I had no idea at all. James: So it’s kind of a weird disjointed thing. Connor and I actually met at band camp when we were sixteen years old when we were in high school. We started a rock band and played together for a few years and won Battle Of The Bands and recorded in a recording studio. It turned out that Taylor ran that recording studio so when we decided to start a country band, we stole Taylor away from the studio. Bobby was playing in a couple of bar bands and he came over to our band. What is the country scene like in Canada? Bobby: It’s like the seond biggest genre after pop I would say. In Canada there is still Festivals with like 40 to 50,000 people showing up and the West Coast is like real cowboys, they do the rodeo and cowboy hats. It is like the Wild West out there. Country is really big in Ontario and Quebec but when you get to Western Canada, it is the number one music there, like in Calgary and places. I have been to Ontario and Quebec but would love to visit the more Wildlife centred areas. James: Go to British Columbia. It is the most beautiful wilderness you will see: the mountains in Whistler: Alberta where you see the trees that are like 25 feet wide. Tell us about your EP..how long did it take to put together? James: It was kind of weird because this was the first EP we had released as a band. We were onto the third single before we released the EP so the building of the record probably took about six months in total. Bobby: It was cool because when we first wrote it, it was like an EP and actually ended up taking Country Album Of The Year at an award show we had in Canada – fun fact! James: We didn’t anticipate to win at all, we didn’t get into this to win awards we got into this to make music so any award is a cherry on top. It’s nice to fit into the American country scene as well and I am not comparing as such but with bands like Old Dominion doing so well there really is a market for you guys. James: We had a lot of tweets actually saying “Old Dominion, next time you are back in the UK, bring James Barker Band with you. Bobby: We are huge fans of those guys, it’s funny that you mention them because we really love all their stuff, it is something we listen to on a daily basis so it’s nice to be mentioned in the same light. James: So there’s a weird little back story to Living The Dream. James: The song that won’t die. It is funny, we never thought that we would record that on a full album and it has followed us for five years. It was right when we first were a band and we used to attend this music festival in Ontario that was really big called Boots and Hearts with 40,000 people. We used to just go and stay in the camp grounds. We were broke at the time and had no money so we wandered around and just played at everybody’s camp site and took requests for free beer and cigarettes. We decided that we would write a song as we went around and sort of picked up lyrics at every camp site that we went to and that is where this song came from. It’s followed us. It’s one of those things that if anyone at the campsite finds out that that’s how it was written, they are probably gonna wanna charge us and want some of the money haha. Bobby: Legally theres about 2000 writers on that song haha. Ah like a pop song! Thank you so much for talking today, please please come back to the UK soon. All: Thank you so much, we hope to.